The large Antress Modern plug-in collection 32-bit includes many plug-ins designed to emulate classic analogue hardware. The SIR 32-bit plug-in is a great basic convolution engine. Here are some good all-purpose reverb impulse responses to use with it: ambiences (2MB ZIP), chambers (5MB ZIP), halls (12MB ZIP), plates (5MB ZIP), and rooms (3MB ZIP), all care of the Echochamber site. The flexible ReaPlugs bundle includes ReaEQ, ReaGate, ReaComp, ReaXcomp, ReaDelay, ReaFIR, and the ReaJS Jesusonic effects host. The home of StereoTool and BitterSweet . A great range of little workhorses, including GGain , GFader , GHi , GClip , GSnap , GRect , GStereo , GTune , and GDuckDly . A great bundle of cross-platform open-source plug-ins, including Combo 32-bit, Leslie 32-bit, Detune 32-bit, SubSynth 32-bit, and TestTone 32-bit. A powerful plug-in suite including MAnalyzer , MStereoScope , MEqualizer , MCompressor , MPhaser , MFlanger , MVibrato , MTremolo , and MAutopan . The home of the powerful IQ4 32-bit dynamic EQ plug-in. Here you can find a great range of plug-ins, including BootEQ 32-bit, PreFIX 32-bit, Density 32-bit, ThrillseekerVBL/LA/XTC 32-bit, FerricTDS 32-bit, Nasty VCS 32-bit, TesslaSE/PRO 32-bit, Nasty DLA 32-bit and EpicVerb 32-bit. Lots of excellent freeware here, including MSED , Marvel GEQ , SPAN , Tube Amp , Boogex , and OldSkoolVerb . Check out the freeware BX Cleansweep and BX Solo plug-ins. Their Reaper DAW is now my go-to DAW mixing platform. It's extremely powerful and ridiculously affordable. The built-in plug-ins are good enough to create professional-level mixes without any third-party assistance, and the editing and workflow-customisation facilities are phenomenal. If you try nothing else, try this. A range of decent low-price plug-ins, including LP10 , Metaplugin , and NYCompressor . As featured in my Freeware Top Ten. The Reverberate plug-in is a decent cross-platform convolution engine. Here are some good all-purpose reverb impulse responses to use with it: ambiences (2MB ZIP), chambers (5MB ZIP), halls (12MB ZIP), plates (5MB ZIP), and rooms (3MB ZIP), all care of the Echochamber site. The freeware FreeG plug-in is good for metering and gain-management. I like these reasonably priced plug-ins a lot, my personal favourites being Schope , The Rocket , Transient Monster , Vibe EQ , CMX , and Bad Buss Mojo . The low-price TrackEssentials bundle from well-respected software developer Jeroen Breebaart is a steal, including the likes of TB Equalizer , TB DeEsser , TB FlX , TB Sibalance and TB Ferox (an updated version of his original classic Ferox tape-emulation). Check out the cool TB FlX dynamic EQ too. A good deal of pro-level chat and some great Q&A forums with high-profile producers. Plus, there's now a dedicated newbies area. Another active forum, with a dedicated newbie zone. Masses of archive material here, much of it deeply techy. A very active forum which includes regular contributions from Sound On Sound magazine's staff and contributors. If you've already exhausted the 'Mixing Secrets' Free Multitrack Download Library and its dedicated Discussion Zone, here are a couple of other places where you can download multitracks, upload mixes, and swap feedback. Another massive collection of on-line articles, although much of it only accessible if you sign up for an (excellent value!) online subscription. Another good collection of on-line articles, although a little difficult to navigate through. Preserved for posterity here are Q&A sessions Gearslutz carried out on their forum with a couple of dozen big names. Although these aren't as focused as published interviews, they're nonetheless very revealing, and provide insights into the working methods of some engineers it's difficult to find out about from elsewhere (such as Mike Shipley and Russ Elevado). A fabulous collection of more than 300 interview videos with dozens of world-famous names. Despite the ostensible focus on Waves products, these interviews are also of general interest, and feature leading lights such as Manny Marroquin, Tony Maserati, Dave Pensado, JJ Puig, and Chris Lord-Alge. There are a few free video interviews available here, and the payware video downloads also feature some good interview footage too, amidst the general tutorial content. There are some reasonable interviews with producers here, but they're scattered amongst links to many other more general-purpose studio-related videos, so you have to sift a little. A cable TV show presented by world-renowned mix engineer Dave 'Hard Drive' Pensado, featuring candid interviews with many current A-list engineers. Probably the best books of collected technical interviews out there, in my opinion. What's particularly good is that Massey often asks the same questions of several different producers, and the differences in their responses are fascinating. Although some of this material is also available from the Mix Magazine Article Archive, it's nevertheless a great collection of interviews. Lots of good straight-from-the-horse's-mouth material. 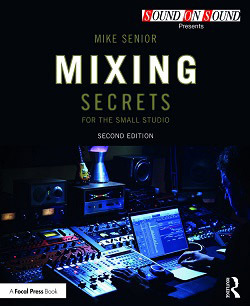 The mix-engineer interviews in the second half of the book are worth the entry fee on their own.